Real Money Poker Rooms – The Top 5 Sites of 2018! When it comes to playing online poker, gamblers want to be able to enjoy their favorite poker cash games and tournaments in a quality setting. We have reviewed several real money poker sites available today and found the top 5 we feel are the best options for players located in the United States and internationally. Read on below to see the top real money poker sites we recommend for players in all locations, with info on bonuses, benefits and more. Available on PC and Mac, Sportsbetting.ag offers the best real money online poker experience, particularly for US residents. The site provides a wide range of poker variants including Texas Hold’em and Omaha. Players can take part in unique options like Boost Poker or try their hand at the Bad Beat Jackpot tables. Sportsbetting Poker also offers players regular tournament events, including $7,500 weekday tournaments and $130,000 guaranteed during weekend events. Easily take part in tournament options whenever you like! For new members to the site, Sportsbetting Poker offers a 100% Welcome Bonus, helping players to increase their bankroll the quickest way possible. One of the most highly rated online poker sites on offer for players in the United States, Bovada provides only the best in real money poker games, guaranteed tournaments, MTTs, SNGs and more. 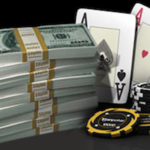 One of the most lucrative options for players at Bovada is the weekly guarantees. The online poker site provides $1.5 million in weekly tournament cash, with plenty of events on offer. Players can also take part in various cash games, Jackpot SNG tournaments and more when visiting the site. New players will have access to a 100% Welcome Bonus, providing extra cash for your new account. Easily sign up via desktop or mobile device. Bovada is compatible with most mobile devices, with apps for both iOS and Android Smartphones. Another great option for poker players located in the US looking for real money online poker is Ignition Poker. This site offers downloadable software for desktops as well as mobile gaming options. With quick seat action find a fast seat in your favorite cash games, and the new chat feature provides members with an instant way to chat. Anonymous tables provide fair gameplay along with SNGs and MTTs on offer. One of our favorite gaming options at Ignition: Jackpot Sit & Go Tournaments. New players to the site have access to major welcome bonuses, including $2,000 in bonus cash. Sign up takes just a few minutes and once a deposit is made, gameplay can easily begin. One of the best online poker rooms for international players is Betway Poker. Here, players will find a nice selection of tournament options and real money poker games. The download is easy to get started and a new player account takes only minutes to complete. For new members to the site, Betway offers excellent promotions. One option on offer is the £750 welcome offer. Add a minimum of £10 to gain access to quick bonus cash. One of the most recognizable names on our list of top online poker rooms is 888poker. Having been in the gambling business for decades, 888poker can provide players with essential poker gaming options. Available via desktop and mobile, 888poker provides players with Texas Hold’em, Omaha and 7 Card Stud, in cash game and tournament format. 888poker members enjoy SNAP, the site’s version of fast-fold poker, with no more waiting at the tables. Wagering starts at just one penny and goes as high as $1,000, providing players of all bankrolls to compete in tournament and cash games. Choose real money when you want to compete for cash while practice play is also available for newbies. New member bonuses are on offer at the site, including an $88 no deposit bonus! These five sites are the best option for players who wish to enjoy quality online poker and win real money in a trusted and safe environment. Give any of these sites a try to enjoy the game online, from home or on the go! If you’d like to learn more about playing online poker for real money, make sure to visit our Real Money Online Poker Guide. We researched every room to find out about its best bonuses, VIP programs and promotions. We also tell you what games are offered at each site, as well as the types of tournaments and sit-and-gos.